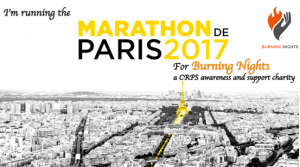 Lauren Smith is a friend of a CRPS sufferer and has decided to run the Paris Marathon next year not only as part of her Bucket List but also more importantly for her friend, Megan. For over a year now I have watched Megan suffer from CRPS and I want to help. We first met in September 2015 when I joined our university trampoline club. Megan quickly became a close friend. However, shortly after meeting, Megan contracted cellulitis in her left foot which eventually turned into CRPS. It has been hard for me to watch a friend slowly lose parts of her body to this disease and to watch her deteriorate so quickly. I can’t even begin to imagine how she feels on a day to day basis. From being with her around university, going to doctors appointments, working with British Gymnastics and from hearing her stories, it has astounded me how ignorant people are to unseen illnesses and the people that suffer from them. I am hoping that, through running this Paris marathon and through the support of others, I can raise awareness of this little-well-known disease so that sufferers can break through the ignorance and get the help they need and deserve. Lauren has so far raised £821.22 for her Paris Marathon fundraiser and you can still donate right up to 9th July 2017! THANK YOU Lauren on behalf of the charity for undertaking such an amazing event as the Paris Marathon – WELL DONE! 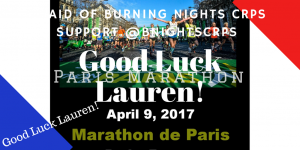 Thank You Lauren for wanting to fundraise for Megan and also for Burning Nights CRPS Support charity! 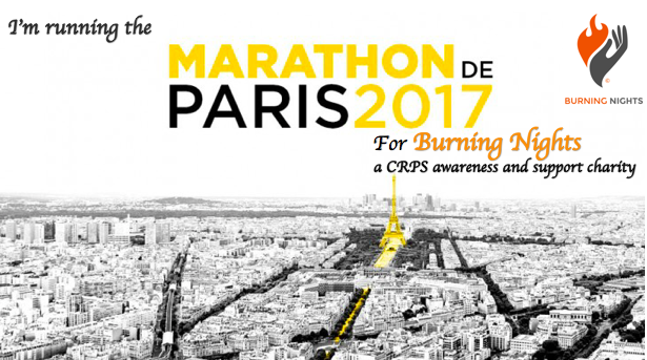 The Paris Marathon 2017 will be taking place on 9th April 2017. If you’re in the area why not go along and support Lauren in her quest! 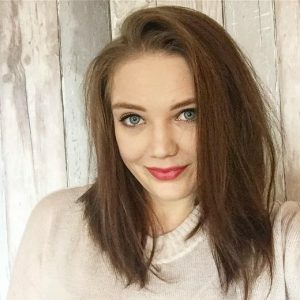 To help Lauren reach her fundraising target please visit Lauren’s PARIS MARATHON fundraising page and make a donation no matter how small or large as every penny counts.